Lightweight and comfortable hiking boots. However, my pair have had durability issues. I bought my Lowa Renegades in June 2015. I wore them when I hiked the Cumbria Way, a long-distance trail in the UK, in May 2016. Needless to say, I did most of my training walks for the Way in the same boots. I found them a little deep in the forefoot, so I fitted a volume reducer under the insole. Even so, the heel grip was a little looser than I would have liked, but this ceased to be a significant issue once I paired the boots with hiking socks that had padded heels. Otherwise the boots felt comfortable from the start and they needed little or no breaking in. The only downside I encountered early on concerned the laces. The lacing system uses a locking eye at the ankle and open hooks on the shaft. You have to be careful when winding the laces around the hooks because they can easily slip out. The laces have to be double-knotted too, otherwise they can come undone. The outsole is not the stiffest there is, but I did not want a stiff, clunky boot. I wanted an all-leather boot that was lightweight and flexible while still being suitable for use on rough terrain. The Renegades fitted the bill perfectly. The outsole had excellent grip on soft surfaces. It bent readily at the forefoot, yet it was stiff enough to protect my feet from stones and sharp edges underfoot even when I was carrying a heavy rucksack. Over time the outsole developed significant wear along the outer edge of the heel, especially on the right boot. But I encountered the same kind of wear with other boots that I had, and the Renegades fared no worse in this respect. There was plenty of mud and water on the Cumbria Way. I liked to go straight through the wet bits with my trouser legs tucked into my socks. The boots proved reliably waterproof throughout, and the only time I got wet feet was when I stepped into some deep bog and water got in over the top. My size 45s (US size 11.5) weigh in at 1,386g (3.056lb) for the pair. This is more than the 1,110g (2.45lb) that is quoted on the Lowa website, but it is still light for a pair of mid-height boots. Does this come at the expense of durability? My experience here has not been very positive. Parts of the Cumbria Way were rough. The leather on the boots creased heavily and they finished the journey looking like something you wouldn’t want to touch without gloves on. After I returned home I was able to restore the appearance of the boots using wax. However, I noticed that the forefoot of each boot was starting to separate from the sole. The Cumbria Way might have been rough on the boots, but I had had them for less than a year and I could not have walked more than 200 miles in them. I got in touch with the retailer, explained the problem, and they asked me to send the boots back so they could examine them. They repaired the boots under warranty and sent them back at no charge. I couldn't complain that the warranty was not honoured. But then I started training for the West Highland Way, another long-distance trail, using my Renegades, and a tiny split reappeared in the right boot. I had already been thinking about using a different pair of boots and this helped me decide against the Renegades. I didn’t want to risk my boots coming apart while I was walking the Way. I have not tried to get my Renegades repaired a second time. Instead I will use them on short local walks. In this role I’m sure I will get many more miles out of them. But I won’t be buying any more Renegades when this pair eventually wears out. Great review, Charles! I'm sorry to hear the boots haven't held up as long as you'd like though. Comfortable, lightweight boot with high ankle support. I'll keep this to the point. I bought the Renegade GTX because I was looking for a full leather, lightweight hiking boot with tall ankle support. The Renegade fits the bill. This boot fits my wide, but low volume foot very well. I have an average arch and find the footbed very comfortable. Although, I did switch out the stiffer stock sole for a pair of Merrell Ortholites just because that's what I like. The Renegade needs about 50 miles of break in. I found the ankle painfully stiff until the point of break in. This made my first hike very unpleasant. Since then, it has been my most comfortable boot to date. Mind you, I mainly go on three-day trips carrying a 30-pound pack. I have had no water infiltration over several water crossings. The tongue joins the boot to give you a good 5 inches of waterproof height. Since this is a full leather boot, I treat the leather with waterproofing every few trips with Nikwax. This should be done with any leather boot. Because it is full leather, and not vented, this boot can get sweaty in summer weather. It feels great in fall through spring. I give traction an A+. The Renegade has an aggressive Vibram sole and has served me well in mud and wet rock. The one dig against the boot, other than being on the hot side, is the lacing system. You have to pay close attention when you lace it up, otherwise the laces can pop out of the lace hooks, as they are undersized in my opinion. Time will tell for durability, which has been a problem on some of the other reviews. So far, I see no weaknesses in construction. I have a hard foot to fit. I've tried Keen, Vasque, and Merrells. The Renegade is by far the most comfortable boot I have worn to date. I was lucky enough to find them on sale online for $160, which is a steal, considering I have seen them as much as $230. Conclusion: This is a great, lightweight boot with great ankle support and suits my needs quite well. I'd buy them again in a second. Thanks for the helpful Renegade review, Lakeman. I'd love to see some pictures of your boots in your review. 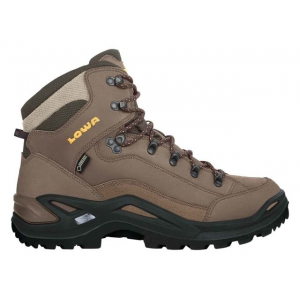 Boot Survey: Lowa Renegade GTX Mid Evan Morkel (M.A. 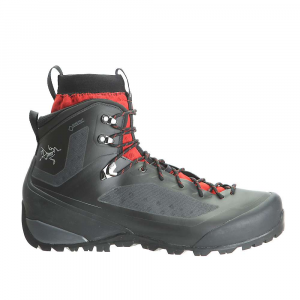 This evaluation is based on a factor analysis of user comments of the Lowa Renegade GTX Mid boot from two websites, one from Germany and another one from United States of America. The impetus for the study was as a result of defects in a predecessor Lowa boot model, the Lowa Duke GTX, having stitching that was coming adrift. Lowa suggested that the author may be at fault through usage and poor care and suggested the purchase of its Renegade GTX Mid as the successor model. The analysis was conducted to see if the Renegade what strengths and/or weaknesses the boot had. Factor analysis from user ratings and rankings were used as no other empirical test was available. For the survey two web sites were used, one from the USA and the other from Germany, the latter is where Lowa has its origin and headquarters. Comments were analyzed from reader reports and factorized as presented below. Information Sources: German: www.idealo.de (Sample size: 16 reviews); US American: www.outdoorreview.com. (Sample size: 35 reviews) Reader evaluations were made between 2006 (April) and 2010 (November). One-off/single comments were not considered but are mentioned separately below each of the positive and negative tables. All comments were ranked from highest to lowest count in order to signify importance. Americans: warm, good stitching, warranty honored. Americans: Expensive/poor value, poor durability, flimsy plastic lace loops, discomfort experienced. The two web sites used, as presented above, demonstrated congruence between German and American consumers. Both groups ranked comfort in first place with the greatest weighting from the US consumers. However it appears that the “softness” of the comfort characterized by the Lowa Renegade may be achieved at the sacrifice of robustness mentioned by users, this being the second most important negative attribute of this boot. In second positive place was the waterproof quality of the Gortex membrane. However there appears to be less agreement from German users as to the effective waterproof quality of the Gortex liner. This may be explained by the wetter climate of Germany, as opposed to that of the United States as a whole, placing greater demands on the boot and its Gortex membrane. Warranty issues were the second most contentious matter, along with soles breaking and boots disintegrating placed first by US Americans and second by Germans in their negative ratings, mentioned by both German and US American consumers. Apparently from consumer reports, unless boots present problems directly after purchase, Lowa is reticent to repair or replace problems associated with their boots (customer service) by either ignoring consumer reports to them and/or placing blame for the problem on the consumer according to user owners. Warranty of boots presents a problem for both manufacturer and consumer as hiking and mountaineering footwear are specialty items not generally worn every day, so usage has to be considered. A simple, “once size fits all”, approach cannot be considered fair to users. In respect of robustness one must be fair to Lowa that this model is probably not meant for extreme conditions such as a Himalayan trek. Here one user complained that his Lowa Rengade had caused him to abort his Himalayan hike because these boots disintegrated completely. Admittedly, they were 6 years old and one does not know how much wear they had during this time. In 2003 I purchased my second pair of Lowa boots because of me being impressed by their comfort, “buy and hike” – no need to break in the boots. 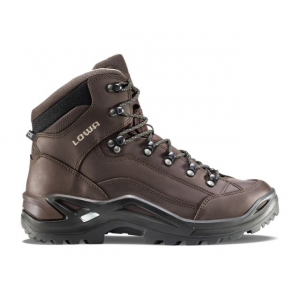 This purchase was the Lowa Duke GTX, the forerunner of the Renegade GTX Mid according to Lowa. As I did not experience any problems with the Lowa Duke, despite warnings that stitching on multi-piece boots could present a problem, I subsequently purchased yet a third pair of Lowa boots. Only recently have I had problems with the Lowa Duke (stitching coming undone, see pictures below) which is the motivation behind my investigating and evaluating the Lowa Renegade. Below: Underside of the Lowa Duke GTX showing the condition and wear of the soles. Clearly the boot soles still have a good profile and the heels are not worn down. 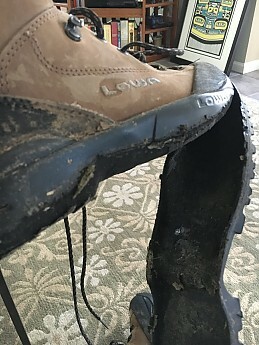 Hence it is strange that Lowa owners report warranty issues in connection with their boots and indicate a hard-line attitude by Lowa. It is hard to understand, if Lowa’s claim that only 1% of customers in the US have warranty claims, that Lowa does not demonstrate more accommodation in respect of these complaints. A 1% loss due to replacement would not impact greatly into Lowa’s profits and the gain in customer satisfaction and increased sales would, in all likelihood, more than compensate for this “loss”. If a clean finish and comfort is your main criteria for purchasing a boot then the Lowa Renegade GTX Mid is a boot to consider. 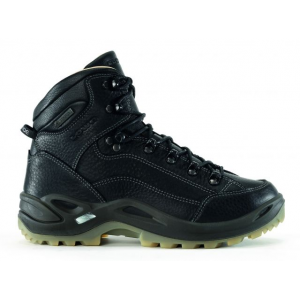 If ruggedness is your priority then this boot may be the wrong choice based on user reports that the sole either wears out quickly or disintegrates. Many users complained of warranty issues with Lowa. Complaints are summarily dismissed or ignored by Lowa. In only one case surveyed Lowa did replace a defective boot as this was shortly after its purchase (Lowa offers a 12 month guarantee). Lowa users report that Lowa suggests that customers abuse their products and this being the sole reason that problems arise with their product. In my experience this is a common reuse used by some manufacturers to avoid any responsibility for replacement of merchandise from dissatisfied customers. Lowa is apparently not in the same league of companies like Sony, Sigma, Schwalbe and others who are quick to replace faulty products not withstanding that boots are subject to tough wear but so are bicycle tires! In favor of the Lowa Renegade GTX Mid is the almost undisputed comfort. Against the Lowa boot is its lack of being a robust boot especially in respect of a durable sole which cannot be repaired. Perhaps the most important issue is the warranty which Lowa keeps very restricted (24 months) and do not appear to concern themselves overly with customer satisfaction other than producing a reasonably good product within the limitations cited above. 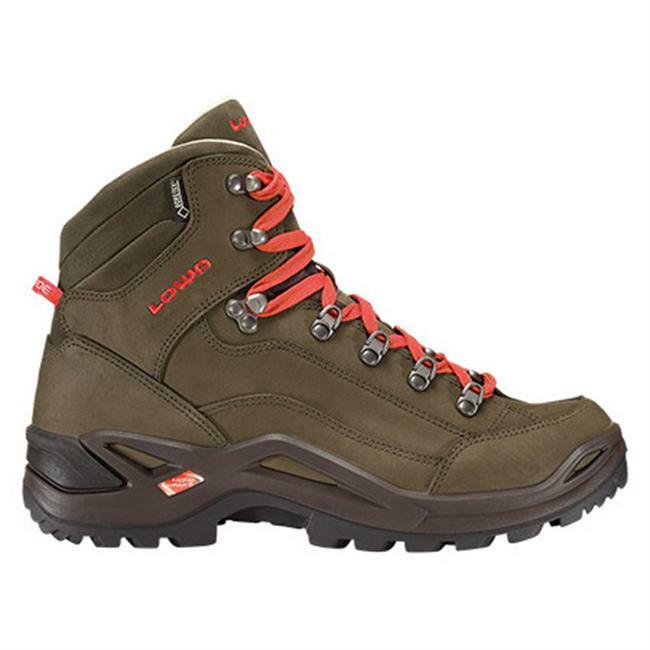 Considering the price of this boot at around $ 200, this is not a cheap boot and the price-performance may not be in balance especially for what Lowa claims is a light hiking boot; it may well be to look at what the competition offers in the same price range. In the final instance, considering the aspects mentioned in the reviews above, the Lowa Renegade GTX Mid can only be recommended with reservation. A prompt response to this article came from Peter Sachs, Lowa’s USA General Manager, and is presented below. Thanks for your report although we are not sure where you are planning to publish this or what your motivations may be. The reality is that warranty issues are less than 1% of sales. Warranty issues do arise from stitching, sole delaminations, hooks & eyelets falling off and almost anything else one can imagine. In some cases, the shoe is well worn, in others it is like new. The boots do come with a limited warranty and we do not just warranty anything and everything that a customer returns to us. If we determine that a boot has been misused, not cared for properly or having lived a full life or similar we reject it. If not, we offer some remedy to the customer. That remedy can vary depending on the situation, the boot, the years of use, etc. There is no uniform response. The boots do not have a lifetime warranty. The Renegade GTX Mid is also made as a day, weekend and light hiker. It is not a thru hiker, it is not a boot designed for climbing 14’ers in Colorado or many of the other things that customers try to do in it. Sometimes, these things do lead to product failure and sometimes the customer is upset to learn that just because they think a boot can do something, we do not think the same. That is why we also sell backpacking, mountaineering and so forth products. The surveys are interesting but to make them real you have to know the back-story. The back-story is not known for any of the results. The real story is that based on real warranties, our return rate is less than 1 %. We do have records of reasons for failure but those are not available for competitive reasons. I am not sure what your intention is with your survey. Clearly you have done some homework. I urge you to be judicious in its use & accuracy. Please feel free to contact me directly with any specific questions. PS. As a matter of accuracy, the Duke was an offshoot of the Renegade. It was available for about 2 years about 8 – 10 years ago. The Renegade has been available for more than 15 years. I love my Lowa boots. They are comfortable, light, reliable, and great looking. Support: These boots offer good support around the ankle and the Mono-Wrap footbed seems to provide good foot support. Water Resistance: I have had no issues with leaks and feel that the one piece GoreTex lining works great. Construction and Durability: In my experience this is a very well made boot and mine have proved extremely durable. After reading several reviews, I thought I would add my perspective. The reason for this is that I have read several reviews stating there are big problems with the durability. For me this is simply not true. I have had no problems with sole separation or delamination. I consider myself to be pretty rough on equipment, especially footwear. The warranty is one year from purchase. Not great, but I was aware of this before purchasing. Six months after buying my 1st pair I managed a large cut along the toe box (my fault). I returned the boots to the retailer w/receipt. They, in turn, sent them back to the manufacturer. Within two weeks, I had a brand new pair of boots on my doorstep. I've had my current pair for about 2 1/2 years and they are holding up great. The previous pictures show my boots as they look today. Summary: These boots have been lovingly abused for the last 30-32 months and are still going strong. I wear these boots for backpacking and dayhiking in the southern Appalachians. I typically encounter mud, wet creek beds, rocks, grassy balds, and snow. My hikes range anywhere from 5-20 miles several times a month. These boots are occasionally worn to work (once or twice a week) and even out on the town. (Hey, they still look good!) The one-piece GoreTex lining seems to be living up to its billing. I haven't treated these boots with anything. Silly, huh? I give them a scrub down in the sink with a toothbrush and a soapy rag and let 'em dry. I would highly recommend these boots to anyone and I will most likely replace them with another pair of Lowas. Thanks for the helpful review, Joe! Thank you Alicia and Goose for the kind words. Had to post a 1st review sometime... Thought I'd start with one of my favorite pieces of gear! Don't think I could get far from the trailhead w/o them! Lightweight, comfortable from the very first try, and no blisters. These are the key ingredients to commend this boot. The mid-high design provides support for weak or compromised ankles, there's plenty of room in the toe box, and the lightweight material dries quickly after river crossings. The sturdy sole accommodates additional back-weight from day packs, backpacks, or recalcitrant pets reluctant to take another step. Great for non-technical climbing and long hikes. Have noticed some chafing on ankle when new. The Lowa Renegade GTX mid hiking boot is a comfortable, excellent fitting boot for someone who needs a roomier toe-box and ankle support. No break-in required, although one may experience a little chafing at the ankles when new. 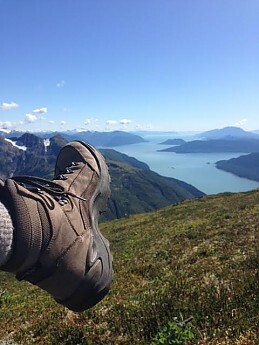 The boot is designed to keep feet dry and it succeeds; lightweight material keeps feet relatively comfortable in warmer temperatures, although Alaska's "warmer" temperatures are generally cooler than most. 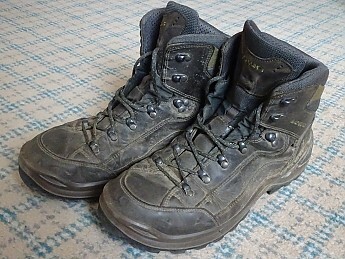 Long lasting; wore the first pair for more than 10 years and only recently noticed them beginning to fray after having worn them to backpack extensively throughout England, the Chugach Mountains in Southcentral Alaska, and the trails and mountains of Southeast Alaska with nary a blister. Welcome to Trailspace, Lynda. Thanks for the review of these boots. It sounds like they have held up well to your many adventures. I'd love to see some pictures of your pair, if you're willing to add them to your review. Thanks! Nice first review, Lynda. Thanks for sharing. Good boots for day trips in dry weather on flat surface. Good boots for day trips in dry weather on flat surface. The boots are extremely flexible, not so good for scrambling or hiking on rocks. These boots are more for the weekend finally-out-of-the-office employee that doesn't go out too far. Or a rich person that doesn't mind changing to a new pair every few years. If very wet, might split open on long hikes. It's unfortunately my second pair. The first pair fell apart after a hike. 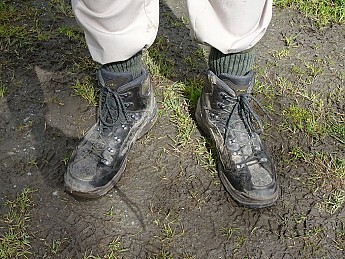 I used the first pair quite frequently on very easy hike, sometimes in rain or mud but always cleaned it, dried it for more than 24hours as recommended. 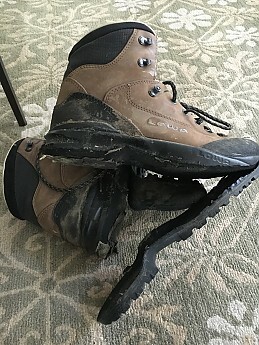 After a wet hike, I noticed that the front and front sides of both boots were split open to a point of no-return. My feet were wet the whole hike and I was wondering why.... I still paid a professional to glue it back together but the boots were completely destroyed. I used the boots for less than 3 years, one to two seasons only. Quite disappointing for the expensive price to pay. After the loss of my boots, I had another hike planned an had no real time to shop around for a new pair and the store I went to only had the same model, just the new style. I'm still hiking with those but I'm always waiting for that one day where I will have to go through hiking with broken boots. The boots are long to dry. After a few very wet hikes, I noticed that to have them 100% dry would take up to 48 hours. In the information labels, it says that you need to dry them completely after every hike, but if you hike in the rain, it can be from hard to impossible to get them dry if you camp overnight. The next morning, you will wake up with wet boots, in and out. Soles not durable (but this may be a weight-related issue. See the detailed review). My wife and I both purchased these boots on the same day, and covered exactly the same mileage. They have been used for a mix of average-hill and some extreme-slope walking. I would not use these on extreme rocky and loose surfaces because the level of grip is not that good. After two years, hers are still fresh and intact on the soles, whilst the soles on mine are very badly degraded (edge lugs crumbling and breaking off). Given the identical ages and distances covered, I can only assume that my larger weight has put more wear and stress on the lugs (resulting in the much worse level of degradation). This is a real shame because the usage over two years (distance and surfaces) hasn't been extreme, in my view. For this reason I would not buy another pair of these. And a real shame because the uppers of the boot are extremely durable and in fabulous condition (nothing like their actual age would suggest). The boots are super-comfortable from day 1. Zero walk-in required. Very waterproof but tend to result in very hot feet in warm/hot weather (my wife had signficant problems with heat rash whilst walking in Italy). Thanks for the review, Andrew. Too bad these didn't last longer for you. Do you have any pictures of your boots you could add to your review to show others the wear issues? I bought these Lowa boots three years ago—for a very healthy price!—and have used them only minimally, about five times a year on easy to mild day hikes. When I took them out to use them a couple weeks ago, the soles on BOTH were coming off. I asked a cobbler to glue them back on (for $11). When I went out walking, the soles both came off within five minutes. They were flapping and shoveling up dirt and snow with every step. Welcome to Trailspace, Brad. Thanks for sharing your experience with these boots. If you have photos of their failures you could add to you review, those would be great for others to see. Thanks for the pictures, Brad. Too bad about the boots. Is it the stitching around the sole that failed, or the glue the holds the sole to the bottom of the show that failed, or the material that the sole itself is made from that came apart? It is strange that this could happen because it isn't as if this is the first time somoeone has made shoes - Shoes aren't a new technology. Yet there are other reviews complaining of the same problem. DrPhun It's the glue that holds the sole to the bottom of the shoe. What is even more strange is that the soles BOTH came off at almost the same time! Specifically, I was hiking on a packed, groomed dirt trail and, first, one sole started coming off. I finished the hike and then brought the boot to a cobbler. He was able to glue the sole back on. Then, when I wore the pair again for a hike a few days later, BOTH soles came loose. By the end of about 4 miles of groomed trail walking, both soles were flapping and buckling underfoot. That's the point at which these photos were taken. I agree it's very weird that this would happen. The insides of the boots are in fine condition and appear to be well made. In other forums, I have recently read it's not uncommon for LOWA boots to have this exact same problem with the soles coming off. It's been noted that it tends to happen after the boots are about two years old, regardless of how much use the boots have been subject to. Multiple posts describe how the company will not do anything to assist the consumer who experiences this. Buyer beware. That is awful. While it is weird, there are numerous reports out there of it happening. So here's my Lowa story...a shoe that feels mostly comfortable right out of the box, costs a lot, and falls apart in a couple of years. First off, I'm very grateful for the beautiful nature that exists. My life is very busy but I'm able to go hiking every once in a while. A few years ago, I bought my first hiking boots. Due to my excitement at that time for the adventure outdoors, I bought three different brands (Lowa, Montrail, Vasque). This mini story/review is about the Lowa brand boots I purchased. They weren't as stiff as the other boots and fit more comfortable right out of the box, so I bought two identical pairs. At that time, they had high reviews and no disclaimers on their website like they do now (perhaps, they received quite a few complaints to put a disclaimer?). 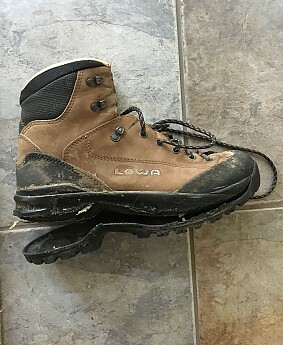 The first pair of Lowa boots I used for hiking once in a while, the second pair was kept as a back-up, brand new, never used. 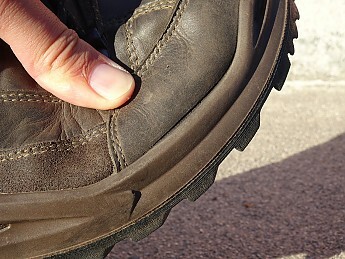 Fast forward a few years, I'm getting ready for a hiking trip, when I notice the sole of the used Lowa boots is cracking and coming off a little. I also inspect the backup pair I never used and they seem fine so I try the never-used pair on. After walking around for 15 minutes, the soles fell off of the never used boots. Still in a bit of shock, I contact Lowa and they tell me, they can do nothing about it (no returns or refunds due to the age). Instead they offer a 10-15% off discount to my next pair with them. Considering that my other pairs of boots (NON-Lowa brand) were the same age with similar usage AND the soles were still intact on them, I don't trust the Lowa shoes to hold up so I declined to buy another pair. In short, if you're an avid hiker and can use your hiking shoes at least every week, then this boot may be for you but if for whatever reason, you need to store them for a few months or years, then don't expect them to be functional the next time you need them. Hopefully, this will save someone from making a costly mistake. Again, if you're a daily or weekly user, then these boots may be good, but if not, then these expensive boots may not be worth throwing away money. Welcome to Trailspace, YYY. What was the disclaimer on Lowa's website about this boot? I couldn't find it. Comfortable pair of boots, but the lace hooks have snapped off on one of the boots making it impossible to securely tie them. Poor material: What is wrong with using steel? Expensive boots: Not fit for purpose! I've been using Lowa boots for decades and I don't understand the comments about using the boots for more than two years. I've never used boot more than two years. I've had no problems with the boots in general but after two years of daily usage they are just done to me, and I get new boots. The main point of failure is the sole itself that just wears away. Lowa boots are not cheap, but at this moment I wear indoor shoes that cost me half of the price of these puppies. I either wear Clarks or Lowa. My last boots were a pair of Clarks which I ditched after 8 months of daily usage due to sole failure. These boots are my new boots and I hope the last me at least 12 months. Again I cannot fathom using boots for more than two years, and using boots for a decade is beyond me. No boot lasts for a decade of daily usage. Welcome to Trailspace, Nico. I hope you let us know how your newest pair holds up. I bought these boots March 11th. By June they started separating at the toe. I wore them occasionally and used them for light hiking and city walking. I have to say they are very comfortable with the addition of better insoles. They come with insoles with minimal cushion or support. Trying to get a warranty from Campsaver or Lowa has been a waste of time. $183 was way too much to pay for shoes that don't last three months. These are NOT hiking boots. I didn't get to wear them long enough to say if they are waterproof. I assume not considering they are falling apart with less than 50 miles on them. I'm not sure how they can be rated so high. I've had better luck with Wal-Mart tennis shoes. Sorry my phone will not copy paste images,only attachments so sent them to trailspace notice. I'm am getting some response now, after the point that I did try to repair them with shoe goo. Hope it holds. 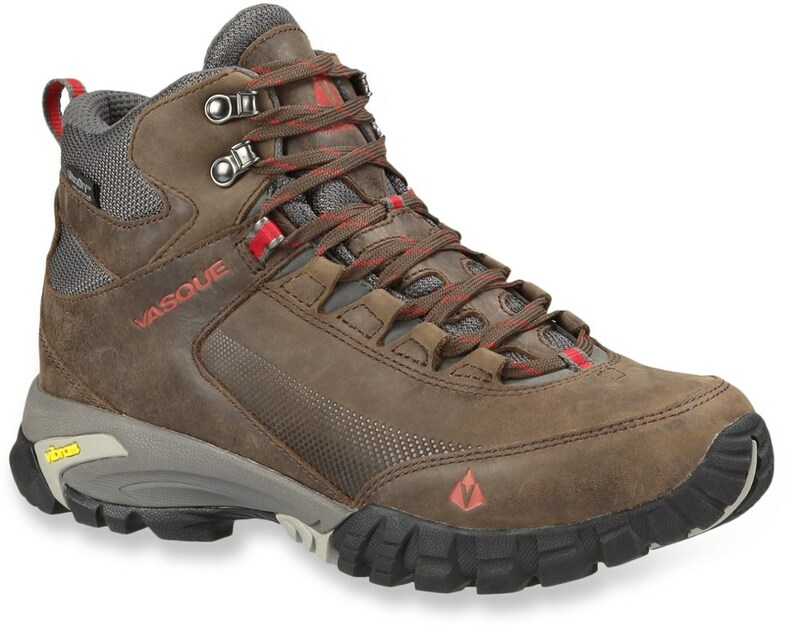 Great hiking / backpacking boot...lightweight and comfortable right out of the box. Just wore out my second pair—over 1,000 trail miles on both. I am a big guy (240 lbs) and I am an avid hiker and backpacker so I am always carrying between 15 and 40 lbs. My average hiking weekend covers 12-20 miles over rough rocky terrain, often wet or muddy too, uphill, downhill, scrambling, creek crossings, snowshoeing, just about every condition available. And I will say this, my feet have always been dry and warm in my Lowa Renegade GTX's. The outsoles are very important to me and I have learned to trust these molded rubber soles. They stick to wet rock like crazy allowing me to step and climb or descend with confidence. They are lightweight for a boot and offer an amazing amount of ankle support. I have often walked through ankle deep streams and always emerge with dry feet. I am a hiking guide and often stand in a stream to help others across and once again my feet stay dry. These boots are easy to get on and off and easy to keep clean and easy to lace up. In summary, I use and abuse these boots on the trail. I hike hard and in every condition and I buy boots that I know I can depend on. I've went through two pairs, and will no doubt buy a third. Welcome to Trailspace, Steven. These sound like great boots. Do you have any pics you could add to your review? We love to see them. Welcome to Trailspace, Steven! Thanks for letting us know how well your Lowas have held up. Boots fall apart within 2 years. I used to buy Lowa boots until my last two pairs de-laminated at the seams. The company would not replace these boots even though they were less than two years old. I had bought Lowa boots for years and I was happy with them, but it's ridiculous to spend all of that money and not have boots last more than 2 years. Fit: They always fit me well. Comfort: Very little break-in time required. Welcome to Trailspace, Cynthia. Thanks for sharing your experience with your Lowas with us. I love Lowa! I have owned five pairs of these boot and cannot express how comfortable they are. I have a bad right knee with multiple surgeries to its name and I have gone through the mill trying to find the right boot. Sadly, Merrell and Keen just can't hold up long enough to justify the money. I am on my feet 45+ hours a week at work and another 10 or so on the weekends in the mountains and 1 thing remains the same! My boots! They take a good while to dry after being wet. I started wearing these boots after trying many other brands. My knees get sore easily whether I'm working or hiking and the Lowa Renegades have helped calm them down. The boot is strong yet comfortable and sticky yet narrow. I have owned five pair plus 1 pair of the low version. My best advice after buying them is to put a healthy helping of waterproof oil on them to protect them from getting wet. Thanks for sharing your Lowa boot review, Ryan. Sounds like these have worked out well for you. Out of curiosity, about how many miles (or months of use) do you think you get out of each pair? Got any pictures of yours you could share in your review? DON'T BUY! Great initially, then the soles separate from the boots after only a few years owning! Soles split, who can take that risk when climbing? Don't buy LOWA boots as their soles are made with materials that are designed for failure. They call it "Hydrolysis" just like Timberland's used to before they were forced to change their ways and use a quality material. The sole will literally separate entirely down the length of each boot at no fault of the wearer. They suggest to check after 6 years for failure, but why not buy a quality brand boot that does not do this in the first place? Also if you did buy a pair, be sure to hold onto that receipt in case you need to call in that warranty (only good for 12 months in U.S., so most likely when they fail a couple of years later you will not be covered). Truly felt when I bought them that I would be getting a quality product that would last. Can't believe they got DOD contracts, definitely not good for our troops. If you are paying this much money get a brand and boot that you can rely on and that will last. Obviously they put short term greed ahead of protecting their reputation. Welcome to Trailspace, rumba. If you have some pictures of your boots and their failures it would be helpful to share those in your review for others to see. Thanks. Light, comfortable, breathable, light hiking boot. This is my second and last pair of Lowa. I hike in Southeastern Arizona, about 15 miles a week. The incredibly rough and rocky landscape chew up my Lowas at an alarming rate. Last year, the stitchings came undone after less than 6 months of use. DON'T BUY THESE BOOTS. Comfortable, yes. For the year they last. Then they fall apart at the seams. Have had two pairs. $500 down the drain. Don't waste your money. I've had two pairs of these. Love how comfy they are, love the grippy soles. But they fall apart at the seams way too fast, right after warranty runs out. After first pair did so, was advised by a gear expert to get $$$ insoles; did so, same thing happened with second pair. I'm a light user, walk maybe 8-10 miles a week, and that's walking, not vigorous hiking. Otherwise wear the boots as everyday around the house/running errands footgear. Unbelievably shoddy. Why doesn't Lowa fix these problems??? DON'T WASTE YOUR MONEY. Really. It's like a bad love affair—you fall in love as soon as you put them on the first time, the relationship runs along happily for a short while, and then it goes all to hell. A fantastic boot. Steady Italian craftsmanship is to be found. Size fits like a glove. Every rock that gets stuck in the treads, you will find in your carpet at home. Lets start by pointing out that I have very picky feet, and a very picky back, and that I am very hard on boots due to hiking every day possible, all day long. The very first thing I did was coat them with a very liberal amount of mink oil, and it worked out very well. It took a good two weeks, for me to break these boots in, and get them loosened up—this time was very well spent. These boots have allowed me to go onto, and into, any terrain so far without fail. They fit like a glove on my feet, and have very durable, and thick, soles. You feel very little under you as you walk. Once again I must admit, the U.S. boot manufacturers have A LOT to learn from the Italian boot makers. You will not be upset buying a pair of these boots. I saw prices averaging, from $150 to $225, for the same boot online, so do comparison shop for these. You won't be dissappointed at all. Midsole cushioning totally deteriorated after about 5 years and 75 -100 miles of trails. Made an otherwise good boot completely worthless. Will not buy LOWAs again. High price for crumbling shoes. I had a pair that I used two to three times a year for about 5 years, 5-10 miles per hike. This fall I broke them out to go hiking on a 7 mile trail and noticed they were not protecting the soles of my feet from the rocks. When I got home and inspected them I found that the soles started peeling off, and the foam above it had all deteriorated. Otherwise, the shoes still look great, but now they are useless. I have several other brands of hiking, hunting, and snow boots, all of which have lasted for over a decade, as long as I took care of them. These light hikers' midsoles just crumbled, and now an otherwise great pair of boots have to be thrown away. I will NOT be buying LOWAs again. The soles of both my and my wife's Lowa boots dissolved after hardly any use. My wife and I both both Iowa boots in Thailand some years ago. Both are different models. They are comfortable but we hardly used them at all. When we did pull them out of the cupboard for a hike the soles completely disintegrated before we even got out the front door, with the sole bottom coming off and the sole innards crumbling. I suspect the humid conditions in Thailand to be the issue. But why sell the boots in Thailand if this is the case? I consider these an expensive purchase that did not deliver. One would expect the soles to hold up over the years, if they are hardly used. I see several other reports of this same issue. Lowa must know about this design fault. The sole fell apart after minimal use Not recommended. I have had a number of pairs of boots over the years. These don’t even rate as boots. My sandals are much more durable. I have owned a multiple of pairs of these boots and while they are very comfortable, they breakdown too quickly and then subsequently need to be replaced. I expect that the major place that most boots should wear down is with the outer soles. These seem to last. What breaks down are the uppers. The rubber on the front of the boots starts to come off and a particular part of an outer seem will come un-sewn. I have owned at least six pair of these boots and they have all broken down in ways that were the result, IMO of inadequate design. It is as if their design life was one to two years (at most). I purchased these boots for my work, which involves a great deal of walking over many types of terrain. Have only had them on for 3/4 of a field season (about 7 months) and they are just about worn out. 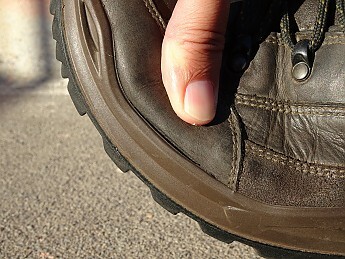 The sole is split where the Vibram logo is on the left-hand boot, and is generally not wearing well at all. The uppers are still in good condition, bearing in mind I normally wear these 12 hours a day, 5 days a week. They started out very comfortable with no breaking in required at all, but the inside pad has worn down in the vicinity of the left big toe. This now gives me a hard area of skin where the cushioning has broken down. Oh, and after 2 months of wear I a broke a lace re-tying them when I was in the field, and of course did not have a spare with me. Did not expect to have to carry one after only 2 months. So in conclusion I am very disappointed in the quality and longevity of these compared to my La Sportiva Trango Trek GTXs, which lasted me 3 field seasons including a great deal of digging and hiking over lava, through desert, swamp, mountains and every other type of terrain you can think of. And I shall be going back to wearing my old La Sportiva boots as they are now in better condition than my Lowas. My husband bought me these boots as a birthday gift as I needed new hiking boots for our trips to Pocono Lake. We go hiking in the Pocono mountains often and love to collect pine cones, leaves and twigs. I am so happy with the quality of these fabulous women's Renegade GTX boots. My feet are sensitive so I need a comfortable boot where my feet feel good. These boots are not only durable but they are soft, stylish, fashionable and soft at this same time. My feet tend to get very sweaty when I'm hiking but these boots allow my feet to breath without getting that stinky sweaty feeling. I've had several pairs of hiking boots in my lifetime and I have to say these boots are fabulous and worth the price. I highly recommend these boots to anyone who is an avid hiker like myself. Thank you! Perfect fit. Softer sole absorbs shock real well. Perfect fit. Softer sole absorbs shock real well. Good ankle support. Lightweight. My last pair of Lowa's lasted for years. Wear them everywhere. They do very well with a 40 lb pack also! And they're made in eastern Europe, not in China. These are the most comfortable boots I have ever used for hiking and backpacking and I absolutely was thrilled to have found the perfect boot. That said, I have used them for 10 days of light backpacking and the soles are tearing off the boot at the glue seams. In contrast I have a pair of leather slippers that have lasted longer walking around for years on my ranch and street running shoes that go 400 miles on rocky trails. Maybe I got a defective pair of boots, but if this is the norm, Lowa's boots are the lowest quality boots I have ever owned. When I give this shoe five stars, believe me they are well deserved. Having tried a total of 12-14 different pairs at three different stores I was not going to stop until I found the perfect fit for the perfect price; one can only imagine how picky I must have come across. Nevertheless, the first time I sliped my foot into these babies I knew this pair was a keeper. The show feels amazingly soft yet at the same time incredibly supporting. My foot was secure both down and up inclines, and cozy the entire time. As for water repellency, one gets what he pays for when purchasing Gore-tex, it is no wonder that they are guaranteed to be leak-free. The best fitting show outthere, at least from the 14 or so pairs I've tried. And moderately priced. Break-in Period: great right out of the box. A great, sturdy tennis shoe is what I call this hiking boot. The soft, pliable sole renders this useless as a hiking boot. They do have good ankle support but the sole is not stiff enough. They broke in way too quickly and after a few months look like I have had them for years without much hiking having been done in them. They are as comfortable as a hiking boot gets but there is no way they can take a load much heavier than your own weight. I use them to work in the yard, walk around town, short dayhikes and just hanging out. They are absurdly overpriced at full price and I still question if I paid too much for what I got. I still give them 3 stars because of the great comfort and looks. I own both the Task Force Edition and the normal edition of this boot. The TF Edition is done all in black leather and the normal edition is done in nubuck. Overall, this is a great design for a boot. The leather on the TF broke in after a couple days and the nubuck felt broken in as soon as I put them on. It doesn't feel like a boot that could do so much, but they really can take whatever you throw at them. I wear mine from hiking to travelling and they never miss a beat. If you're looking to do some serious backpacking, then you may want to look elsewhere, but for lighter backpacking and hiking, these boots are a great investment. O land-survey for a living so I live in my boots -- literally... was afraid of a lot of seams at first but this boot is solid and the gore-tex liner keeps my feet dry...I've treated the boot and it seems to keep the water out -- again, the gore-tex liner seals the deal...good support from a high scree collar but it never rubs me raw and hasn't from day one. Lowa offers their boots in three different widths, which is incredible -- I put the boot on and knew immediately I had to have it...I have never had such a perfect fit around the heel and the break-in was nonexistent...can't say enough about this boot. If you're looking for a lightweight boot for day hikes, this one is ideal. I found it extremely comfortable and sturdy. After two years of heavy use as a field biologist in a wide variety of areas from desert bouldering to tropical rainforests, these boots have held up extremely well. No dampness, even in very wet conditions. I'm shopping for another pair at this moment...highly recommend. Depending on what you're looking for this boot is either a 3-star or a 5-star boot. This boot is one of the lightest on the market at 2lbs 3oz for the pair! They're amazingly comfortable and the fit is very nice. On the downside, the midsole is VERY flexible and doesn't offer any torsional stability. You can see this by picking up the boot, toebox in one hand and heel in the other, and twisting your hands in opposite directions, i.e. like you're trying to twist the boot much like ringing the water out of a towel. Note how easy it is to twist the boot. Now try this with just about any other boot and you'll see what I'm talking about. 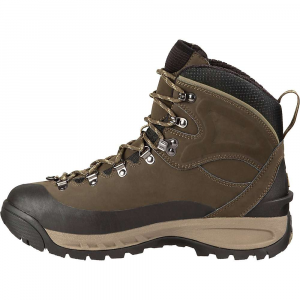 If you're looking for a really comfortable day-hiker then this is a great boot. However, if you expect to carry any kind of load over uneven terrain then I wouldn't trust it. Great boot, but I abused them greatly. About 15% of their use was on trail and the remaining 85% was off trail in very rugged scree and razor sharp carbonate rock. They lasted about a year, close to 500 miles, and are now retired. They are very comfortable, needed at most one mile for break-in period, waterproof, breathable, and lightweight. If you are planning to use them for a lot of trail hiking and even moderate backpack loads (~30 lbs) they should be okay. Anything past this and you may be asking too much.